Now run the following command to convert the .cap file into .hccapx format using hashcat. Command: ./cap2hccapx.bin <.cap file path> Now copy the .hccapx file to root because we need this file with naive-hashcat script.... Cracking Microsoft Office (97-03, 2007, 2010, 2013) password hashes with Hashcat For anyone that is not familiar with it, Hashcat is one of the most well known password cracking tools at the moment, primarily due to it’s lightning fast speed. 8/06/2013 · Run hashcat against your new capture file (choose the version of hashcat that machines your CPU architecture and your graphics card): cudaHashcat-plus32.bin -m 2500 .hccap Enjoy your crispy new password!... To use hashcat the .cap file needs to be converted to ahccap file to do this use air-crack-ng aircrack-ng -J Run hashcat against your new capture file using the correct version. hashcat is that cpu hashcat does the combination of the plains given in a single dictionary file (word list) This implies that one should specify only and exactly 1 (dictionary) file within the command line for hashcat (besides the hash file).... For example the 1080TI Founders edition GPUs have a 91C BIOS thermal throttle, but hashcat will stop at 90C causing it to thermal stop at times without using some additional switches with hashcat, so you may have to tweak settings depending on your setup. 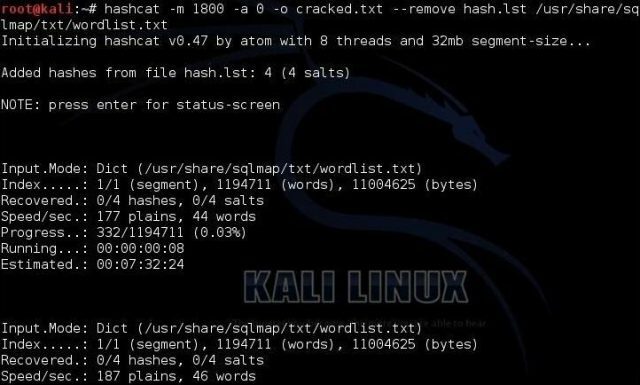 Cracking Microsoft Office (97-03, 2007, 2010, 2013) password hashes with Hashcat For anyone that is not familiar with it, Hashcat is one of the most well known password cracking tools at the moment, primarily due to it’s lightning fast speed. 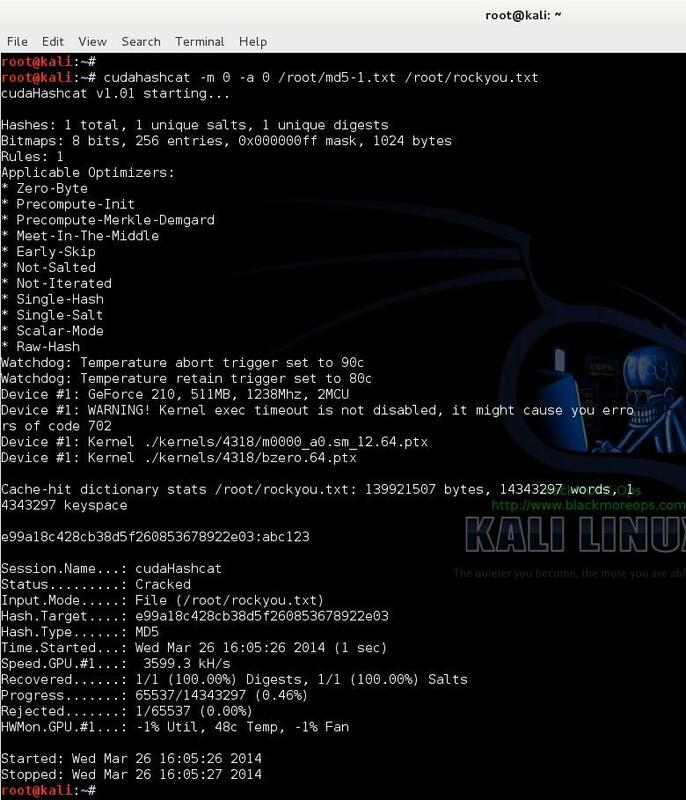 Run the following command :: hashcat -m 1000 password.hash rockyou.txt (m=mode of cracking , 1000 for NTLM hashes) Check status and if the password is cracked or not. Can anyone help me eith issue with hashcat and cudahashcat64 i have all drivers installed correctly but hashcat is 1000 time faster than cudahashcat. to crack 8 letter including upercase and digits passwords takes 10 years in cudahashcat but when piped to pyrit using hahscat 1hr 12 Minutes the VGA driver is gtx760 and works with no errors. This package is unlisted and hidden from package listings. This package was approved by moderator gep13 on 5/23/2018. Hashcat. The world's fastest password cracker.